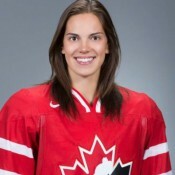 Halli Krzyzaniak is a defenceman from Neepawa, Manitoba. Halli played for the University of North Dakota women’s team for four years before the program was cut prior to the 2017-18 season. Halli has been wearing the maple leaf since was 16, and made her senior national team debut two years ago. Halli has won medals with the team at the last two World Championships, and was part of Canada’s centralized Olympic roster in 2017, but unfortunately was one of five left off the 23-player roster. Krzyzaniak intends to focus on her hockey career for the time being, and has plans to start medical school in the future.